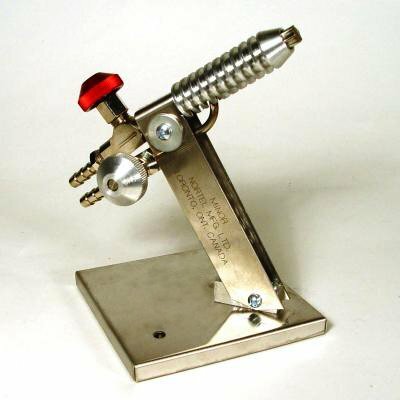 Developed by Peter Norton in the 50's, this solid workhorse torch made lampworking at home an affordable possibility. Reliable, virtually indestructible, almost every lampworker owns one! Specs: Surface mixed, 7 ports. Natural Gas or Propane, with Oxygen. Will run on tanked gases, as well as oxygen concentrators. Cleaning and Mantenance: Clean the tubes regularly with the fine needle tool that is included with the torch. Use for lampworked beads, small sculptures and marbles, up to 3" in diameter. Primarily for use with soft glass. It will melt boro, albeit slowly. Not for production borosilicate use, but you can make small sculpted items with no problem.